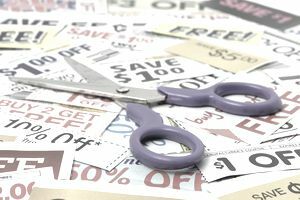 Using a coupon for each item you buy is a great way to save money, but why stop at just one? Learn how to stack coupons, and walk away with more free and nearly-free items every time you shop. Look for store coupons for the same items. You'll typically find these in sales circulars, on store websites, and on your receipts. If you have a frequent shopper card for any of the grocery stores in your area, you may also receive store coupons in the mail. Check for cash back offers. Ibotta and Checkout 51 are two cell phone apps that give you cash back when you buy specific items, and they can be used in conjunction with coupons. Matchup store and manufacturer coupons for the same products. To have a usable match, the coupons need to be the same product size, fragrance, etc. You also need to have one coupon that says, "store coupon" and one that says "manufacturer coupon." Put your coupons to work. Shop for all the items that you've found matches for; present your coupons to the cashier; then, smile when she tells you your teeny tiny total. Submit your receipt for any cash back offers when you get home. Stack your coupons with a store sale or a rebate to save even more. Combine a buy-one-get-one-free coupon with a buy-one-get-one-free sale, and you could get both items for free. Sometimes store associates aren't as familiar with their store's coupon policies as they should be. Print out a copy of each store's policy, and bring it with you to clear up any problems that may come up. Many stores accept competitor's coupons. Find one that does, and you can stack a manufacturer's coupon with a competing store's coupon. When Is the Best Time of Year to Buy New Car Tires? Have You Learned About This Secret Source for Half-Price Computers? What Are Some Ways to Save Money in January? Where Can I Find Coupons for Healthy Foods?